#arttoday “Swans Reflecting Elephants”, serene Friday by the water! 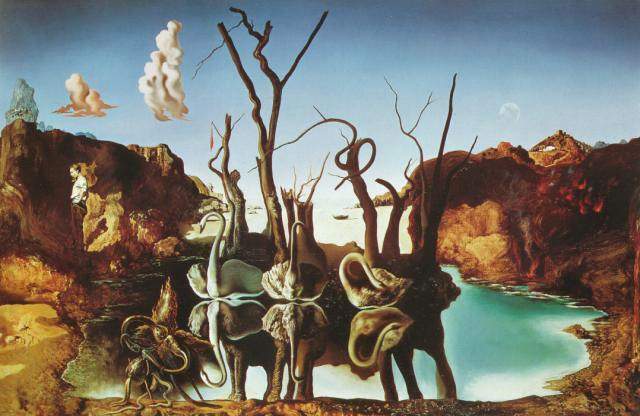 As a lover of water and a keen follower of perceiving water reflections everywhere I go, here is what I recalled and found today, one of my favorite art pieces- “Swans Reflecting Elephants” by Salvador Dali, 1937. It brought the serenity I need towards the end of a tiring week and tough times, while in a transition of recovery and renewal. Oil painting on canvas, this is a great work combining reflections on water with creative perception. 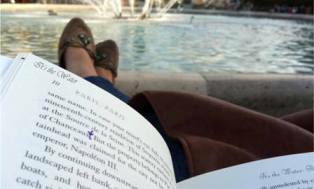 It makes you feel as if really sitting down by the water and watching your mind, your thoughts transforming to images of your mind..
Down by the water, is where I love to both calm down and get inner-energized to go with the flow. It’s the water, as my top motto and favorite phrase in life, that reflects & recalls the joy of life in me the most at all times, it unites the power to both hold on and let go; to go with the current as well sometimes to stand still against the cross-current. This entry was posted in joy of art and tagged #landscapepainting, art, art today, dali, dali paintings, down by the water, perception, reflectionsonwater, salvador dali, serenity, swans reflecting elephants. Bookmark the permalink.